Turtle Island Resort nestled in the Yasawa Island Group, is an all-inclusive luxury property – one of the most inclusive in Fiji! It is also an exclusive adults-only resort featuring 14 beautifully appointed Bures that are nestled along the beaches of the Blue Lagoon – known for its role in the movie with the same name. 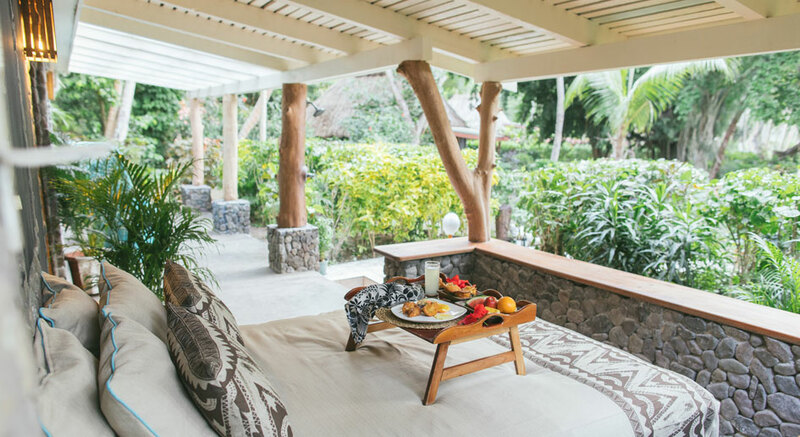 With many private beaches to spend lazy afternoons, each couple is also treated to their own Bure Mama – a casual butler who will take care of only you during your stay. Ensuring the ultimate in privacy, this luxury Fiji resort allows no more than 28 guests on its 500 acres at any one time. We have the best rates and offers available on Turtle Island – and have firsthand experience of the island and all of the special things that we pre-book for you such as the floating pontoon dinner and sunrise horseback ride! Turtle Island Resort and Spa offers 12 lovely “Grand” Beachfront Bures along their lovely Blue Lagoon as well as one smaller deluxe Beachfront Bure which happens to be located closest to the water. The island also offers the ultimate Vonu Point – the most private hilltop Bure located at the end of the beach. All are exquisitely private, spacious, and with very upscale décor in Fijian hardwoods, large Jacuzzi and four poster king sized beds. All meals and beverages are included on Turtle Island Resort. There are also various options in addition to the lovely dining area such as dinner on the beach or in your Bure, on a floating pontoon with only candlelight, or at the lovely mountain top location. Just let your Bure Mama know and she will make the arrangements for you. Turtle Island Resort offers a lovely Grand Wedding on the beach, or location of your choice. While there is a standard to how weddings are performed, the resort is able to tailor your plans to meet your needs, such as being married on horseback or on a floating pontoon. The number of weddings is limited to one per week so that each is very personal and special. All activities are included at Turtle Island Resort including diving (one trip daily), deep sea fishing and horseback riding, to name a few. The snorkeling and diving in the area is amazing. Hand-line fishing is available; a guide can be arranged if necessary. There are many other activities available as well at no charge! Children under the age of 18 years of age are not permitted at the resort, unless it is during family time. Family time occurs twice per year: over the Christmas/New Year holiday for three weeks, and during the summer for three weeks. They make open this up to the Easter break but it is still unknown. Turtle Island pricing varies depending upon the time of year. Turtle Island Resort packages include seven nights’ accommodation (one or two of which are free), round trip transfers to the resort (in most cases via seaplane, but catamaran could be used in inclement weather) all meals &; beverages, all resort activities, airport/resort transfers, and all associated taxes. Please click on the request quote link below and let us know of your time frame and whether you are coming for a Honeymoon, Wedding or other special occasion. We will respond promptly with pricing and availability. With only 15 couples on the island at any given time, space is always limited!